As mentioned last week, we’ve had a great deal of fun chatting with the savagely smart Blue Rose Girls, and this week our site is graced (figuratively and literally) by the presence of the prolific and talented Grace Lin. As their site explains, Grace is one of the original Blue Rose Girls, having initially bonded with fellow illustrators Anna Alter and Linda Wingerter in 1996 and then eventually bringing the other ladies (Alvina, Meghan, Libby, and Elaine) on board. Grace is a consistent and always informative blogger over at the BRGs’ site — posting on such topics as racial identity and labelling in multicultural books; her thoughts on blogger book reviewing; her conference visits and author talks; how to boldly and confidently get your name out there and make a living as an author/illustrator; her own party-throwing (parties to rival the New York KidLit Drink Nights any ‘ol time, thanks very much); what it means to her to be a “multi-cultural author”; and much more. And Grace also has her own personal blog, Pacyforest, where she’ll keep you up-to-date on her writing and illustrating (“I’m a children’s book author and illustrator which means my secret life is full of drama, intrigue, adventure . . . and pink fuzzy bunnies,” she writes at the site). Did we mention Grace is rather prolific? Yes, she’s guided by a generous and creative muse. Her first novel ever, for middle-graders and released in 2006 by Little, Brown & Co., was The Year of the Dog, in which we follow a young girl’s adventures during the Chinese Year of the Dog. Pacy, the novel’s protagonist (as well as Grace’s nickname, one born of her Chinese name, Pai Se), discovers that this is the year she is supposed to “find herself.” As the year goes on, she struggles to find her talent, makes a new best friend (a character based on the real, live Alvina Ling), tries to figure out what makes her unique yet also how she fits in with those around her (family, school, friends), and discovers just why the Year of the Dog is a lucky one for her after all. You can visit this link to see the whole heapin’ bunch of awards her first middle-grade novel received, including being named a 2006 ALA Children’s Notable, a Kirkus Best Early Chapter Book 2006, one of the New York Public Library’s 100 Titles for Reading and Sharing 2006, and a 2006 Booklist Editors’ Choice for Middle Readers. 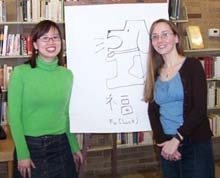 The Year of the Dog is an autobiographical novel, and during the novel, we read about Grace finding her true calling to write and illustrate children’s books. And if you want to know even more about the novel, read here (.pdf file), Grace’s essay on why she wrote the novel. Fans of this novel will be happy to read that The Year of the Rat (Little, Brown Young Readers), in which Pacy learns that the Year of the Rat symbolizes new beginnings and change, will be released in January of next year; Grace discusses this follow-up novel a bit more below in our interview. This May will mark the release of another picture book, Lissy’s Friends (Viking). Grace’s site explains here that in Fortune Cookie Fortunes the older sister makes her fortune (“your imagination will create many friends”) come true by creating enormous paper origami animals. “This is her story (and the origami animals’! ),” writes Grace. You can read some early blogger reviews here at a wrung sponge and here at MotherReader. Grace also discusses Lissy’s Friends and why its publication is extra special to her in this interview, conducted by Pam Coughlan (a.k.a. MotherReader), at The Edge of the Forest’s April ’07 issue. MerryMakers will also be releasing a Lissy doll, which Grace discusses briefly below. It may surprise you to realize that Grace Lin has written and illustrated ten picture books, has illustrated nine others, has written two novels, and has five different books coming out soon. For such a prolific and accomplished author/illustrator, she retains a low profile and humble spirit. It’s part of her charm. In a way, she is reflected in her art. Her work doesn’t jump out with revolutionary, aggressive style. It’s not showy or dramatic. Then stop to notice the intricate patterns everywhere, but never clashing. Look for the detail in the leaves on the trees or the puddles on the ground. Find more in the sum of the parts. There’s joy in the beauty of the pictures. There’s honesty in the simplicity of the words. That’s Grace Lin. Grace was also the driving force behind the Robert’s Snow: For Cancer’s Cure fundraising effort after her husband, Robert, was diagnosed with bone cancer and after writing Robert’s Snow (Viking Books; 2004) soon after his diagnosis. The auction raised over $100,000 in its first year after the publication of this book, which features many award-winning children’s book illustrators and their artwork for the cause. One hundred percent of the royalties from the book’s sale went to the Dana-Farber Cancer Institute. The snowflakes that were created and donated by children’s book illustrators can be seen here at this link at the Robert’s Snow site. You can read Grace and Robert’s story here, but she discusses it below as well. Grace also keeps herself busy doing school and library visits, which you can read about here at her site. Here she is pictured on the left with Eisha at a talk she did at the library in Cambridge in which Eisha works . . . Grace also has a whole slew of upcoming titles and projects, which she discusses below. So, without further ado, let’s chat with the talented Ms. Lin, and we thank her kindly for stopping by 7-Imp. Grace: I’m a children’s book author and illustrator, full-time — a true contradiction to those who say you can’t make a living doing children’s book (as noted in one of my recent BRG posts). Grace: Since September 2005, according to my blogger profile. Grace: Well, I’ve talked about that a lot, most recently here. But in a nutshell, I don’t really blog for readers — I use blogging as another outlet to vent, celebrate and share things. It’s a place where it can be all about ME — so, I blog for thoroughly selfish reasons. Until I have grown to an extent where I am no longer so nauseatingly self-centered, I will continue blogging . . .
7 Imps to the prom if they’d go with me. However, I think they already have dates. Grace: Riding my bike, eating food that is bad for me, and oogling things that I can’t afford but imaging that I can. Okay, in an ideal world, where I would be witty and interesting and I could obtain some of the talent and knowledge of my guests through osmosis . . . let’s say: Amy Tan, Beverly Cleary, and Tasha Tudor. Natalie Babbitt and Tomie DePaola would be great too. Let’s make it a party! Grace: I’m an undercover secret agent. 7-Imp: Now for a few more questions specifically about your work as an author/illustrator . . .
How gratifying was it to have your first middle grade novel receive so many awards and make so many Best Of lists and to have it generally be so well-received by both reviewers and your readers? Grace: I’m absolutely thrilled Year of the Dog was received so well by readers and reviewers. It is really gratifying it is to feel that people “get” your work, especially kids. Before with my picturebooks, I would get e-mails or letters from parents or teachers, but for Year of the Dog I started hearing directly from kids. And that has been priceless. It’s fun to see what they are curious about (they all want to know if my Mom really did sleep in school. She did!). I hope the sequel, The Year of the Rat, is as well-liked. 7-imp: Tell us a little about Robert’s Snow: For Cancer’s Cure. We know you’ve had to scale back your own involvement with organizing the fundraising events — was that hard to do? Any news on what the 2007 event will be like? Grace: In 2004 and 2005, the community of children’s book illustrators rallied to my side and offered their talent and time to paint original art on snowflake shapes (see all the snowflakes here). These snowflakes were auctioned off on eBay and the project made more than $200,000 for cancer research! It was truly amazing. It made me proud of the children’s book community and honored to be a part of it. But the project was incredibly time-consuming and stressful; I couldn’t keep up with all the demands and keep my own life going. So, after the 2005 event, I planned on retiring the project. But, by then, the hospital was so impressed by our project they offered to take on the administration and managing. So, Robert’s Snow 2007 will be mainly their project. It’s hard to let go. After I send the database of artists over to them, things are out of my hands. I find myself stressing and worrying that it won’t be successful. But then I give myself a nice mental slap, as I know I should trust the hospital to do a good job. I trust them with my husband; a fundraiser should be a piece of cake. 7-Imp: Is Ki-ki totally jealous that Lissy has her own doll? For that matter, are you? 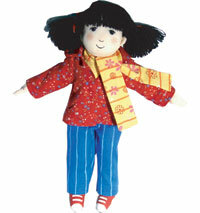 Grace: Ki-Ki is a little grumpy that it is not a Ki-Ki doll, and there is no book just on her. I’ve promised to get to that someday . . . As for me, I’m glad it’s not a Pacy doll. Or else both sisters would be sticking pins into it! 7-Imp: Can you tell us all about The Red Thread, First Moon Baby, Bringing in the New Year, The Year of the Rat, and any other upcoming titles or ones that you might be working on? Any shows/exhibits/events you’d like to tell us about? Grace: The Year of the Rat is the sequel to the The Year of the Dog; it takes place two years later. The year of the rat symbolizes new beginnings and changes — the girls are a little older and Melody is about to move! Alvina (the character Melody is based on) really did move in real life, as were the adjustments I had to make. This book was a little difficult to write as there were things I didn’t like admitting to (my own racial biases, etc. ), but I did because I knew they were important for the book to stay true to its theme. This book is, perhaps, the most revealing of all my books. Gosh, now that I think about it, that’s kind of scary! Hmm, I think it’s too late to call off the presses. The Red Thread is a fairytale with a Chinese adoption theme. I’ve done many events with families that have adopted from China, and it’s also something my husband and I considered (until they tightened the restrictions); so, it is something that I truly appreciate. Many of these Chinese adoption groups have taken the legend of the red thread — a belief that people destined to be together are joined by an invisible red thread — which was originally for marriages and reinterpreted it for adoption. I thought that was fascinating and wonderful; I love how myths are and can be transformed over time — it makes them more real, more “living” somehow. So, I took their interpretation of the red thread and made a fairy tale story out of it. Bringing in the New Year is about the customs of preparing and celebrating the Chinese/Lunar New Year. It follows the same family in Dim Sum For Everyone! and Fortune Cookie Fortunes (my family). The artwork in this book is my best to date, in my opinion. There is a gatefold spread, the grand finale where the Chinese Dragon parade is revealed that took me forever to paint that I am especially proud of. First Moon Baby is about the Chinese one-month naming and celebration customs. That book isn’t coming out for a while, so I won’t spout off too much about it now, lest readers get bored . . . This is a starting to become rather merciless! Let me just say, if readers would like to get updates, etc. to sign up for my newsletter on my website. Grace: Pretty colors, plenty of sleep, and a happy husband. Grace: Mean people, unhygienic public bathrooms, and sleep-deprivation. Grace: “Great Googlie-Mooglie!” Not that I ever remember to use it, but I feel like if I did it would turn whatever I was cursing about into a funny moment. Grace: My husband whistling in the shower. Grace: Taiko drummer (I’d like to have big strong arm muscles) or cake decorator (I have yet to master a frosting flower). Grace: Accountant. Just thinking about taxes makes me break into a cold sweat. Thanks for another fine interview, ladies. Grace, I can’t wait to read THE YEAR OF THE RAT…and I can’t wait to see LISSY’S FRIENDS. We’ll have a super party to celebrate your birthday and the release of your new picture book! Eisha, I hope you’re coming to the party. I had to scroll through this wonderful interview twice — first, to get the eye-popping visual thrill of perusing Grace’s art, and second to listen carefully to what she has to say. She is the epitome of author-illustrator combo excellence. Grace my chickadee, we’ve got to meet somewhere in the Hub soon for dim sum and/or samosas. Grace is so talented and seems so sweet. Thank you for this lovely interview. Okay, this is the first time I scrolled down to see the curse word first – because I couldn’t imagine what Grace Lin would say. Love her beautiful artwork and wonderful writing. What a special lady. Thanks for sharing the interview. Great interview Grace! If anyone ever gets the chance to see her work in person – DO! You will marvel at all the detail that goes into her work, so keep tabs on her exhibit schedule! Another lovely expose, ladies. Grace, love your post about learning to speak in public. It really is rewarding, just like you said, but it takes some effort to push past the shyness, so bravo for you! What a lovely interview, and what beautiful pictures! !